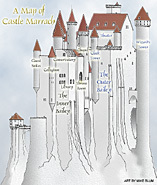 The Castle Marrach Player's Guide, version 2.1  A gorgeous and comprehensive guide of Castle Marrach in a downloadable 48-page PDF (1.0 Mb). This is a must for all Marrach players. These excerpts from, supplements to, and updates of the Player's Guide contain more basic information that any Marrach player will want to have.